Boston’s long slog back to .500 continues. The Red Sox split a four-game set with the Indians last weekend and then earned a three-game sweep in a ridiculously well-pitched three-game series against the Twins that saw a total of seven runs scored between the two teams. The finale on Wednesday was the type of win every good team needs once in a while. John Lackey went nine scoreless, but the Sox entered the bottom of the 10th inning down a run after Koji Uehara uncharacteristically surrendered a homer (Chris Parmalee, no less). Enter David Ortiz and Mike Napoli, who went back-to-back to end the ballgame and clinch the sweep. Boston began a West Coast road swing last night in Oakland against the Athletics, who came into the series boasting a differential of nearly 100 runs better than any other team in the American League. They added to that with a 4-2 win behind Scott Kazmir, who kept the Sox in check for seven innings aside from allowing a two-run homer to Dustin Pedroia. On WEEI.com earlier this week, Alex Speier noted the importance of the club’s rotational depth, which has been a chief reason that the team’s hopes of making a run at a playoff spot this fall are still alive. In the absence of Clay Buchholz and Felix Doubront, Rubby de la Rosa and Brandon Workman have made the most of their opportunities. Though both Workman and De La Rosa are relatively young in age (both are 25) and baseball years, both offered the Sox players with some big league track records of success. Yet even while those track records suggested that they might not be overwhelmed, the fact that they have yet to encounter a major hiccup is noteworthy. In five starts by Workman and four by De La Rosa, both have thrown five or more innings every time they’ve taken the mound; Workman has yet to allow more than three runs, while De La Rosa has given up four in two starts and none in two starts, including Monday’s one-hit, three-walk, three-strikeout effort in which he elicited 12 outs via ground ball. De la Rosa’s fastball velocity in his four starts has been particularly impressive. He’s the only pitcher on the team who is capable of going out and throwing 94-95-mph consistently for six-plus innings. And yet, he’s blooming at a time when Clay Buchholz is just about ready to rejoin the rotation. Meanwhile, Workman’s six-game suspension offers Felix Doubront an opportunity to start tonight against Oakland. Coming back from a bruised shoulder, Doubront will pitch for the first time since May 20. He has thus far underwhelmed with a K/BB rate of 31/19 in 45 innings this season. The guess here is that if Doubront shows some life on his fastball, he may be moved to the bullpen as potentially a better lefty option than Chris Capuano, who has been used sparingly over the last two weeks. When a utility infielder who looks like Matt Damon circa Good Will Hunting makes his first start in center field and does things like this, he’s going to win a lot of fans in Boston. Boston designated the struggling outfielder for assignment on Tuesday and called up Garin Cecchini for what could be more than just a one-day stint (as the team did earlier this month). Ben Cherington left the door open for Sizemore to potentially return to the system on a minor league contract after the 10-day waiver period. Sizemore is reportedly still healthy, so its likely some team looking for outfield depth will take a flyer on him. Looking back at Sizemore’s Boston tenure, Shane Victorino’s prolonged absence forced the team to cross its fingers and entrust the veteran outfielder to be a key contributor in the offense. From Baseball Reference’s Lineup summary page for the team: Sizemore was the No. 5 hitter in the most common batting order used by John Farrell this season. Granted, Farrell has only used that order four times in 73 games, but Sizemore led off 10 times, slotted in at No. 5 for 15 of his starts and as the No. 6 hitter in another eight games. Sizemore simply did not hit for enough power to justify being an everyday starter in a corner outfield position, let alone a middle-of-the-order presence. The Red Sox will head north this weekend in preparation for Opening Day in Baltimore on Monday. President Obama will meet with the team the next day to honor the 2013 World Champs. Things are about to get serious. With the announcement of the latest iteration of a contract extension, the Red Sox and Big Papi have all but guaranteed that he will never wear another team’s uniform as a major league player ever again. The extension, um, extends in theory until 2017 if Ortiz hits certain playing-time escalators. A few years ago, Ortiz wasn’t all that difficult an out for left-handed pitchers. It would have seemed unlikely that Ortiz’s at-bat total had a chance to remain anywhere above 500 as he looked to be evolving into a platoon DH. However, none other than Adrian Gonzalez has been credited with counseling Ortiz in his approach against southpaws, which is proving to be an important development considering how well Papi has done against lefties the last two seasons. Gonzalez was reported to be a malcontent while he was on the Red Sox and this latest news proves all the conjecture. Knowing the Sox are basically obligated to pay Ortiz as long as he wishes to keep playing, A-Gonz was clearly helping Ortiz out in order to continue to cost the team millions of dollars years even after he went back to the West Coast. Demonic! Forbes pegs the Red Sox franchise with a current value of $1.5 billion. The Yankees place first at $2.5 billion and the Dodgers are second at $2.0 billion (which also, interestingly enough, matches LA’s projected payroll for the 2017 season at its current rate of growth…). Regional television deals in larger markets are significant factors in many of these numbers, not only for the country’s top TV markets in New York and LA but also in Boston. The Red Sox own an 80% stake in NESN, which significantly aids the team’s value. While ticket demand is on a relative downturn now that the team’s sellout streak has ended, Forbes notes that the Red Sox saw a 14% increase in ratings during the 2013 championship run. Bob Marley’s “Three Little Birds” was a Fenway favorite last year as Shane Victorino’s walk-up at-bat music. However, MLB has now capped hitters’ walk-up music playtimes at a completely un-alright 15 seconds. Yes, the team could cut out the first 10 seconds or so of the song, but isn’t the build-up all part of the fun? It seems that no matter what happens, if Shane’s going good, Fenway fans are likely to serenade him during the at-bat even if the song isn’t playing. Last year, Fenway Pastoral provided a detailed history of various promotional pocket schedules released throughout the years during spring training. Ever the vehicles of optimism, pocket schedules provide a nice snapshot of how the team plans to advertise its product to the fan base. For example, team-designed pocket skeds distributed last year centered on bringing pride back to the city after the 2012 Bobby Valentine-Helmed Abortion. 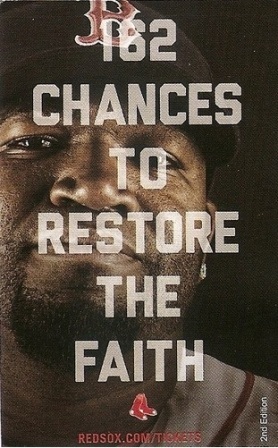 The whole 162 Chances to Restore the Faith thing worked out pretty well. Indeed. Opening Day is less than 72 hours away. News of David Ortiz’s contract extension is drawing a variety of viewpoints from People With Opinions regarding whether the proverbial “hometown discount” has played a role in Papi’s compensation. It’s a pretty amusing argument given that Ortiz has never been paid more than $14 million in a given season. On the other hand, he’s been paid about $125 million up to this point, counting 2014. The basis for any kind of discount debate basically comes down to the intellectual dishonesty of either ignoring how little Ortiz was paid as he was proving himself to be a superstar or ignoring the cumulative amount of money he’s earned because he has been successful in Boston. 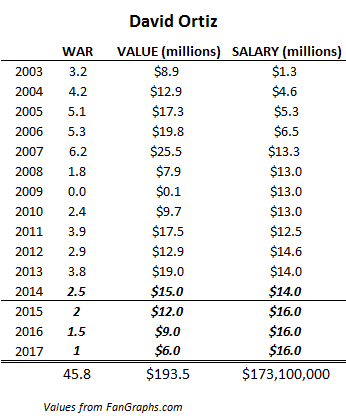 Looking at his annual WAR and corresponding salaries, Big Papi was basically grossly underpaid during his peak seasons and then essentially paid aptly during his declining years. 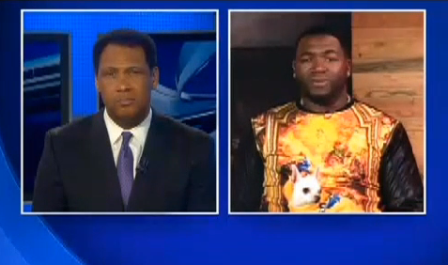 On an extracurricular level, Ortiz has also obviously cashed in on his local hero status (as he should). Since Ortiz first became a Red Sox in 2003, the price per one WAR has gone from around $3.0 million, based on FanGraphs.com estimates, to close to $6.0 million per WAR this year (based on expected production versus the money doled out for free agents who signed during the 2013-2014 winter). One of these years, given his age, Ortiz is likely to fall apart, whether it’s gradually – due to decreased bat speed – or more abruptly as a result of an injury. Or, Ortiz could still be on the team in 2016 and 2017, based on the extension announced today. There are vesting club/incentive options for 2016 and another club option for 2017. Both of which are based on plate appearances and could very well lead to some discomfort if Ortiz enters into a prolonged funk at the plate and begins losing ABs as a DH. There are therefore a number of possibilities for scaling up Ortiz’s salaries based on his performance. We can assume the team has at least in theory allocated $16 million for each of the next three seasons, 2015-2017, in the event he continues to defy the odds. It’s hard to imagine Ortiz hitting all escalators, but since the deal has been done in part to appeal to his pride, you have to figure there is at least a non-zero chance that he earns $16 million in 2017 if he, say, hits 30 home runs at age 40 during the 2016 season. If all that were to happen, here would be the breakdown of his time with the team. As shown in the chart above, if we look forward to the next three seasons for Ortiz, using his projected 2014 WAR of 2.5 as a baseline and assuming he loses about 0.5 WAR of productivity each season, Big Papi can be expected to ultimately net around $173 million in salary over the course of his Red Sox career while producing about 46 WAR overall in a Boston uniform. That works out to a payout of around $3.8 million per WAR. 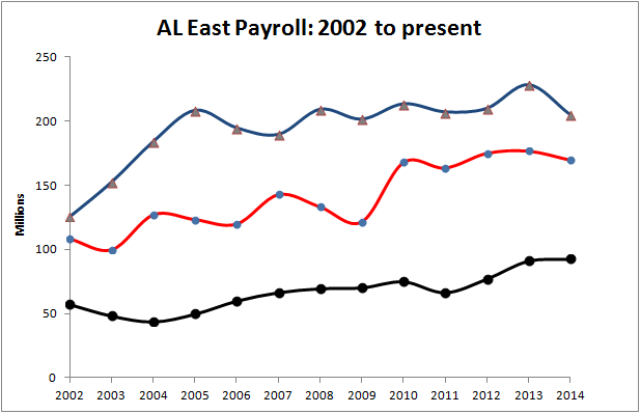 Based on that production, the Red Sox will have gotten $20 million in surplus value thanks to his output in peak years. Meanwhile, all of this could be instructive when trying to figure out what Jon Lester’s “hometown discount” extension, which seems to be an inevitability, may look like. With Ortiz more or less guaranteed to end his career with the Red Sox, it looks as though the team has established something of a baseline for what it will pay to keep a fan favorite around longer than it perhaps would normally stomach. If the Sox and Lester agreed to a five-year, $125 million extension, he would wind up with the exact same cumulative WAR as Ortiz over essentially the same amount of time (14-15 years) and right around the same total compensation ($169 million for Lester versus $173 million for Ortiz). Five years and $125 million seems like way more than the Red Sox would be willing to give any pitcher given their past track record. John Lackey hasn’t been quite the disaster many want to believe after all, but the team hasn’t come close to revisiting a five-year deal approaching nine figures since. Then again, if Lester doesn’t sign now and pitches well during 2014, he may be a goner given that Max Scherzer supposedly turned down six years and $144 million (as ESPN’s Gordon Edes noted in the article linked above). To bring this back full circle, one can argue pretty easily that something like a five-year, $100 million deal would indeed represent a substantial “hometown discount” on Lester’s part. After all, he has – albeit more quietly and often with a scowl – done nearly as much for the Red Sox as Ortiz. Meanwhile, since Lester began his career with Boston and was paid minimum salaries while under the club’s exclusive control, it’s conceivable that he could end up generating about $50-60 million in surplus value, even if he does get that $125 million deal as modeled above. 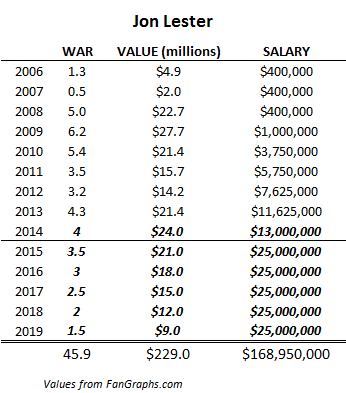 Lester has never even come close to being paid more than the WAR value he’s generated. The team has benefited more from Lester than Ortiz on a cost-of-production basis because he was developed internally and was extended at a team-friendly deal near the end of his rookie contract. It’s just business as usual for a front office that is proving to be adept at valuing its assets and making shrewd business decisions. The Red Sox aren’t going to be getting any hometown discounts from Ortiz or Lester because they’ve already gotten them. And it’s unlikely either player feels obligated to extend a discount, regardless of what they may tell the media when the question inevitably comes up, in one form or another. Unfortunately, that’s not the type of narrative that warms the heart or generates a whole hell of a lot of page hits and drive-time callers. The baseball season is rapidly approaching. Pitchers and catchers will begin to show up in Fort Myers in about a week and position players won’t be too far behind. Some guys, like Daniel Nava, Jon Lester, Xander Bogaerts, Will Middlebrooks and Jackie Bradley Jr., have already been down in Florida for a few days. Unless you have a strong opinion about who should bat leadoff or the relative merits of re-signing Stephen Drew, buzz around the team continues to be fairly minimal considering the Red Sox won the World Series last year. That figures to change in the next couple of weeks. On FanGraphs, Paul Swydan comes to the conclusion that Shane Victorino and Dustin Pedroia are the most logical candidates to take over for Jacoby Ellsbury vacated leadoff spot in the batting order. Ellsbury’s replacement in center is Jackie Bradley Jr. and, at first glance, may seem like he fits the bill since his on-base rate in the minors was strong. However, Bradley does not have a lot of raw speed, nor is he a notably better baserunner than Victorino or Pedroia. That’s leaving out the difficulties JBJ had getting on base at the major league level during his brief stint with the team at the start of the 2013 season. As Swydan notes, the youngster who could enter the leadoff discussion isn’t JBJ but rather Xander Bogaerts, who showed an almost shocking amount of poise and discipline during his postseason at-bats. Bogaerts has a keen batting eye, which make him an ideal candidate to hit at the top of the order. He struck out a fair amount in his very brief major league debut, but a) The Book reminds us to not consider strikeouts when constructing a lineup, and b) Bogaerts’ strikeout numbers in the minors were not egregious, and he should adjust as he gets more plate appearances. If he hits right from the jump, he would probably make for a better candidate at the top of the order than would Victorino, simply from the standpoint of being able to see more pitches. Victorino was right around league average, at 3.83 pitches per plate appearance (the American League average was 3.86), but Bogaerts was up at 4.10. Victorino would figure to get the first crack at leadoff once the season begins. John Farrell seems to be the kind of guy who appreciates continuity so even if Shane struggles at the start of the year, this argument could be a non-starter if the team is scoring runs. Lineup construction is of limited value to begin with and there is no sense putting undue pressure on Bogaerts if it can be avoided. Moronic talk radio fodder: What if he’s gotten TOO SKINNY? Drew was great for the team last year. 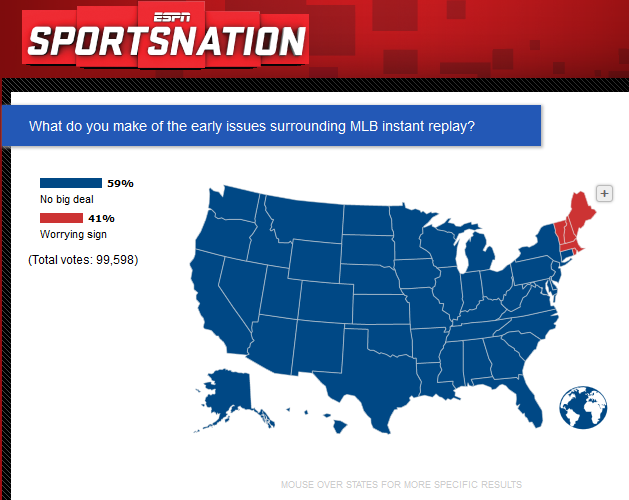 But it’s worth asking why the Red Sox continue to be interested. Is it because they’re simply not convinced Bogaerts can handle the shortstop position at the big league level? Or is it that Drew could be had for a salary so far below what his production merits that Ben Cherington just can’t pull himself away? Or are they doing Drew the favor of keeping in touch to aid his market? After all, it’s looking like Drew probably did the Sox a courtesy by declining arbitration and a 1 year, $14m contract. The primary news of the week coming from official team releases was the announcement of the team’s 2014 Hall of Fame Class: Pedro Martinez, Roger Clemens, Nomar Garciaparra and radio broadcaster Joe Castiglione. But let it be known that the team hasn’t had any inductions since 2010, a year that included inductees such as John Valentin, Jimmy Piersall and Don Zimmer. Pedro, Clemens and Nomar all go in together. Here’s hoping Schilling is able to kick this as quickly as possible and that he gets a fair chance to show what he has as a color man in the ESPN Sunday Night baseball booth.